Welcome to Andrea Hunter! She won second place with her story "Silent Partners" in the Fall 2014 Flash Fiction Contest. If you haven't checked out her story yet, you can read it here. 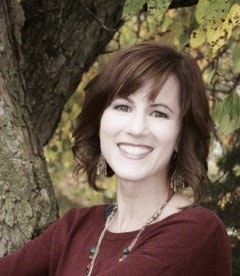 Andrea lives in St. Charles, Illinois with her husband and two of their three children. Andrea has always possessed a passion for writing and now that her oldest has left the nest (and the other two quickly approaching that blessed age) she has more time available to nurture that passion. Her poem, “Space Invaders of the Grandchild Kind” was published in Country Kid's Magazine, September 2001 edition. Andrea is currently in the process of revising and editing her first co-authored novel, The Celestial Thread. Stop by www.thecelestialthread.squarespace.com to read an excerpt—just click on "Sneak Peek" in the menu and enter the password: WOW. WOW: Congratulations, Andrea, on winning second place in the WOW! flash fiction contest with your story "Silent Partners." Please tell us how you came up with the idea for this story--where the narrator kind of misleads the reader for a while because of her condition. Andrea: Thank you, Margo! And a big thanks to WOW! and guest judge Rachel Brooks for choosing my story. The idea for "Silent Partners" actually evolved from a childhood memory of mine. Where I grew up, in southeastern Ohio, there are a number of power plants and factories situated along the river. I was always fascinated by the way these places looked at night, so different from how they appeared during the day - each structure outlined with bright lights, varying heights, and constant movement - like a cityscape against the night sky. That image has always stuck with me, and as I was considering Daria's story, it kept popping into my head. She uses the visual of city lights to center herself, to bring her deeper into the illusion her life has become. WOW: Interesting! I'm glad I asked that question. Where did you come up with the title? Andrea: I actually struggled to come up with a title for this piece. I considered several others before choosing "Silent Partners." I was worried that it sounded too cliche, but it seemed to be the only thing that truly fit the meaning of the story. I'm glad I stuck with it! WOW: What are some themes you are exploring in this story? Andrea: I had several themes in mind as I wrote the story: ambition and power - Daria's quest to make partner eclipses her moral compass, escape - she creates an alternate existence in order to cope with what has happened. Loss - both Daria and John suffer the heartache of loss on many levels. And love - despite the pain Daria's situation has caused, John remains devoted to his wife. WOW: So true! You have co-authored a novel, and thank you for letting WOW! readers have a sneak peek at it. Who did you co-author with and what was this experience like? Andrea: I co-authored my first novel, The Celestial Thread, with my dear friend and creative kindred spirit, Denise M. Smith. It's been an amazing experience to say the least. We met almost ten years ago when our youngest two were in preschool and something clicked. Through our years of creative endeavors together, we discovered that we each had a hidden passion for writing, so to us it only made sense that we take the next logical step and write a book together! Like anything we do, we jumped in with both feet and haven't looked back. Sure, there are times when writing along side someone has its challenges, but we've learned to work through them - mutual respect and a firm grasp of the big picture keep us on track. But having each other to share ideas with, to provide instant, honest feedback, and for moral support has been priceless. WOW: In your bio, it also states that your children are getting ready to fly the coop and you have more writing time. SO, what is your writing routine like? Andrea: I try to make time to write every morning. Whether it is substantive material or simply getting thoughts and ideas down on paper - I write. The rest of my writing practice is far less routine - some days are spent creating and editing, while others end up being fettered away thanks to that laser-light cat toy known as Google. There is always room for improvement, so it's definitely nice to have longer periods of uninterrupted time to hone my writing skills. I'm currently taking an online class offered by WOW! (Create Memorable Writing With Literary Devices by Gila Green). But the biggest change that has come from having semi-independent children is that I'm able to take advantage of resources outside the confines of my "nest." For example, I attended the 2014 Chicago Writer's Conference and have participated in several writer's workshops in the last year. WOW: Awesome! Thank you, Andrea, for giving us a glimpse into your writing life. Best of luck to you in your future endeavors!